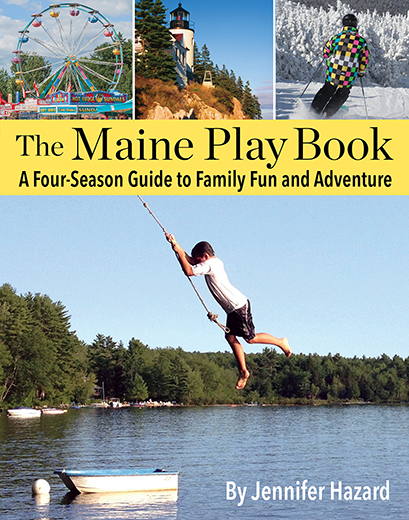 She booked a tiny cottage at Fox Carlton Pond Camps, a sporting camp located on 63-wooded acres in Philips, Maine. Owner Jon Pound made our crew feel immediately welcome, pointing out all of the camps’ amenities, which included hiking trails, a pickleball court, and views of a vast trout pond. Jon walked us to our cottage, which was perfect for our small group. The cottage had a kitchen, built-in bunk beds for kids and a cozy master bedroom. Before he left us to unpack, Jon offered to build a campfire for us outdoors. Our crew enjoyed the best kind of fall evening with shepherd’s pie for dinner and s’mores for dessert. The next morning, we decided to explore the grounds. We walked a short trail to the Sandy River, where we found big rocks to scale along the water’s edge. Our original plans were to hike Tumbledown Mountain in Mount Blue State Park, but CP#2 had a nagging ankle injury that we knew would prevent him from a longer climb. We decided instead to explore the Western Mountains by car, stopping at some of the places on our wish list to see, which included Smalls Falls, Mount Blue State Park, Rangeley Lake State Park, The Height of Land, and Coos Canyon. Phew, right? We covered a lot of ground, but the views we experienced were worth the travel time. Smalls Falls is a roadside picnic spot with some trails to explore. Among these first four stops, it’s hard to pick a favorite, but MP has a soft spot for Mount Blue State Park in Weld. She hopes to return in summer to swim at Webb Lake with its white sand beach and sprawling views of the Western Mountains. And the short but scenic Center Hill Nature Trail is perfect for little ones (or 10-year old boys with sore ankles). If she had known ahead of time, MP would have planned to have a picnic at this peaceful spot, where you can look out at both Tumbledown and Jackson Mountains. Our next stop was Height of Land. MP had heard so much about this roadside destination on Route 17, and it did not disappoint. We walked out of the car with mouths agape. The views of the valley, Maine mountains, Toothaker Island and Mooselookmeguntic Lake are nothing short of spectacular. This is not your average roadside stop. We lingered awhile but knew we needed a few more daylight hours to explore Coos Canyon in Byron, another unique roadside stop. At this location, the Swift River runs through a deep gorge and the rocks are left with striped patterns and smooth textures. When the water level is low, kids can safely climb among the rocks. This trip was one which we were so grateful to experience. While we couldn’t take the long hike we hoped for, there was still so much to see and do outdoors. All of us returned home loving fall more than ever.